The invention — Areola REMOVABLE Tattoo — is made by a woman, for women. Dorothy Kizoff, Canadian Master Cosmetic Tattoo Artisan designed and manufactured two prototypes in March 2010 and got great feedback from women who had previously undergone breast reconstruction surgery. Based on patient input, Dorothy refined the designs and manufactured three styles to best match your skin tone. 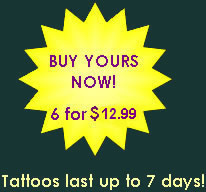 Get 6 areola tattoos on one sheet for $12.99US or buy 2 sheets for $25.98US and get one more sheet for free. No sales tax and shipping is free on all orders. © Copyright 2000-2013 iBrowsers™ Canada.